Sure, you know that you need a rain jacket if it's going to rain, but what do you think about a dress that changes light intensity if it's sunny or cloudy outside? 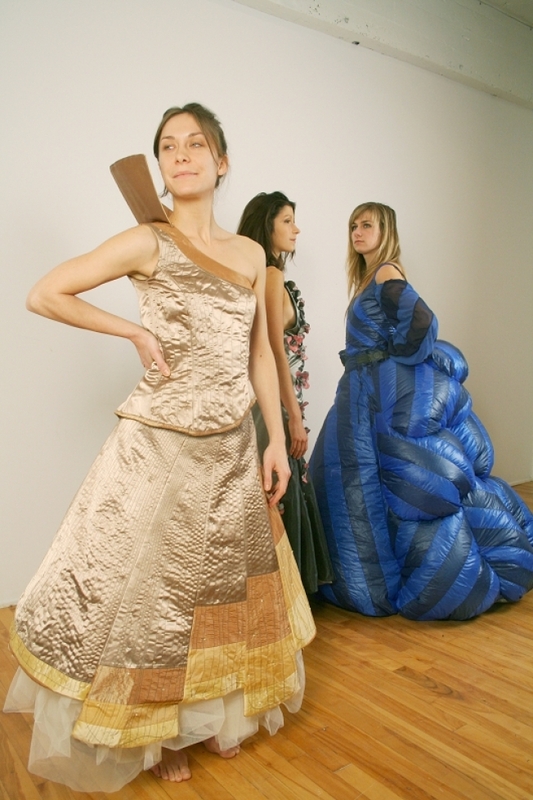 Artist Valérie Lamontagne has created a series of dresses that change based on the weather. These interactive dresses are based on the fairy tale "Peau d'Âne" about garments made from "immaterial" materials: the sun, moon and sky. Weather data, including temperature, moon phase, wind speed, UV and more are sent wirelessly to receivers in the dresses. Microprocessors in the dresses then react to the weather data. The dress representing the sun has 128 LEDs, the Moon Dress has 14 flowers that represent the cycles of the moon, and the Sky Dress has 14 vibrating air pockets to represent the wind. Can't you hear it already? "Does this weather pattern make me look fat?"